Robometricschool. - Maybe someone today need everything more easy and effective, included with their garden lamp at home. There are many garden lamp operated manually to turn-on and turn-off. Someone need to turn on in the night and turn off in the morning manually. Garden lamp can not work automatically, when condition is dark garden lamp will turn on and when condition is bright garden lamp will turn off automatically too. I think it is very important in this day. Someone will not again confuse when they go to leave home who will turn on and turn off garden lamp. To take solution for this problem i think someone can use automatically garden lamp that can work automatically. Garden lamp will turn on when condition is dark, and garden lamp will turn off when condition is bright. To solve this problem robometricschool present Automatic Garden Lamp Electronic Circuit Schematic to Turn on and Turn off lamp automatically. 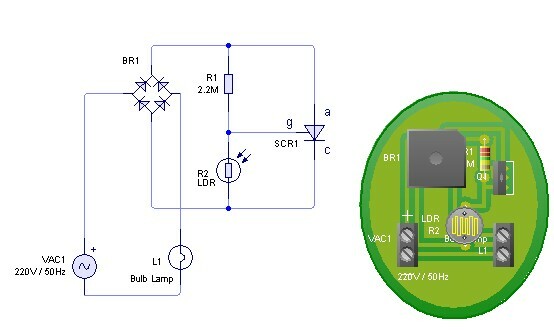 With this simple electronic circuit schematic of automatic garden lamp you can realize this schematic for real sequence. It is because i give you free schematic circuit and PCB layout from here. you can adjust value of R1 to get good performance of sensor LDR, if in your practice with 2.2 M ohm still turn on the lamp you can add value of R1 with the large of 2.2 M ohm. BR1 is used as rectifier of VAC 220 volt to DC 220 volt. And it will charge the other components. R1 and R2 is used as voltage divider. 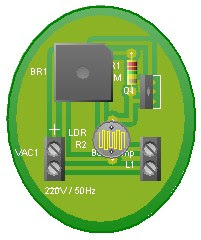 R2 is LDR that resistance will change when LDR in the dark or bright condition. And then it will change voltage in R2 as input of gate SCR or thyristor. If VR2 is too small SCR will close circuit and VR2 is high SCR will open circuit. SCR or Thyristor is operated with DC voltage 220 DC and will operate like electronic switch with triggered from gate. SCR will open and close depend of voltage from gate terminal. If the circuit and schematic connected with lamp (bulb lamp) and source voltage 220 VAC it will make lamp turn-on and turn-off automatically depend of dark or bright condition. Note: capacities of bulb lamp depending of SCR capacities and diode bridge. 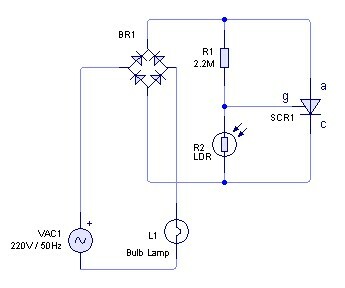 In practical this circuit only suitable for bulb lamp not Tube Light lamp. If you interesting with this circuit schematic of automatic garden lamp and want to modified the schematic or PCB layout, we provide you original file of Schematic and Layout PCB that you can download freely. To open this file you can use PCB Wizard software, because we design schematic and PCB layout using PCB Wizard. Figure 3 is sample of PCB Layout that we generated using auto route from PCB Wizard. You also can take Free Download Software PCB Wizard from here.